It is such a pleasure once again to be able to discuss the lovely artistic coherence of Declan and Jordie. This cover is visually stunning because of the wonderful composition and textural lighting. In the middle of the piece is a small man or a woman standing alone but acts as an integral part of the image by providing focus and perspective to the terrifying atmosphere. The sway of the raincoat brings an air of vulnerability to the natural environment at hand, coupled in with the fact that it is a dark place with very poor visibility. The green hue to the light comes from atop giving the impression that it is a cave of sorts and the exit is far above. This builds up the tension and drama but if you focus on the details, you can really appreciate the intricacies of the creators. The cave wall are precisely delineated and the colouring brings the depth and size to them. The colouring fades laterally but centrally it is almost columnar in shape, indicating that there is a small entrance and the light dissipates away from the core. Following this down we can only see mild glimpses of what appears to be waves in motion. Moving towards the central character there is vegetation but it seems to almost be coral like in shape. It seems quite ominous that these plants are shining quite brightly brings further mystery as it seems the whole environment is underwater. It is only the dryness and motion of the figure that makes us think it is inherently a giant cavern. You can visualise the combination of background details and colouring to bring out the eerie landscape and heighten the sense of danger. It is the sheer unknown that poses so many questions and brings a foreboding anticipation as you turn that page. 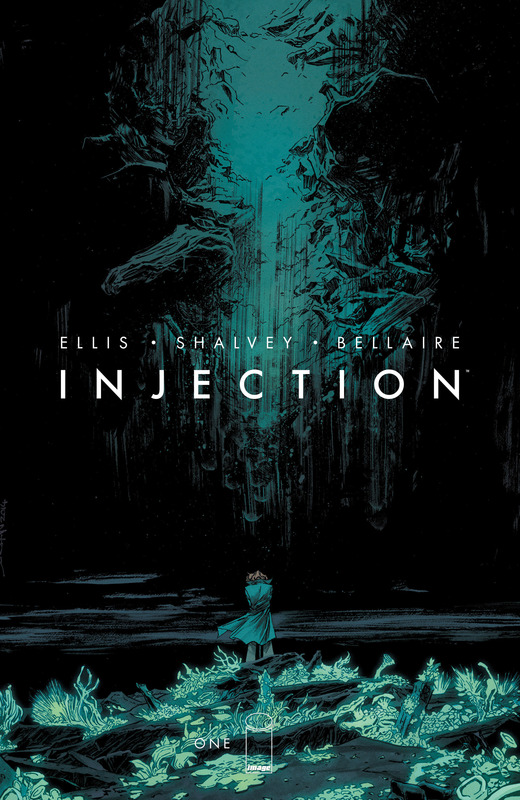 Impressive work as always from the beautiful combination of Shalvey and Bellaire. Next PostThe Theatre List 13/5 – The Indys take Battleworld!